Today we celebrate Roald Dahl’s 100th birthday. There have been lots of celebrations happening throughout the year in honour of Roald Dahl 100. We have been proud to be associated with and participated in some of these. J has only recently been introduced to the wonderful works of this most brilliant of children’s authors. We read The Minpins as part of the Big Friendly Read. We are currently reading The Enormous Crocodile. I was slightly apprehensive about how well the gore would be received by my five year old. I need not have worried. 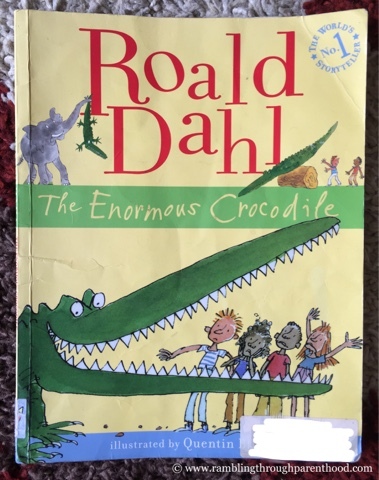 Turns out, there is nothing more fascinating to a five year old little boy than the imagery of an enormous crocodile chomping on little children. How would I know? I was never a five year old little boy. M was, and he thinks it is entirely normal behaviour that our son enjoys reading and at times recreating these graphic scenes of imagined carnage. As part of the on-going centenary celebrations across the nation and to mark Roald Dahl Day, J’s school has organised a Dahlicious Dress Up Day. Children have been encouraged to go to school dressed up as their favourite Roald Dahl character. Having read two of Dahl’s many books and watched The BFG in cinema this summer, J wasn’t sure what he wanted to go as. The child is not too keen on dressing up anyway. And he detests having his face painted. That did not leave us with very many options. I went with the obvious choice. 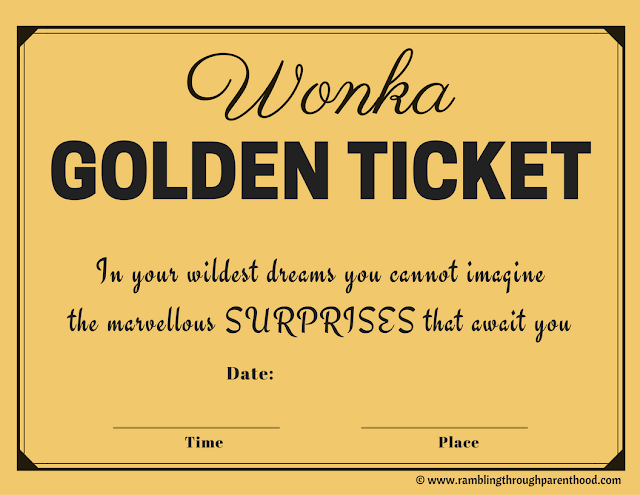 J would go as Charlie Bucket from Charlie and the Chocolate Factory, armed with the precious Golden Ticket. 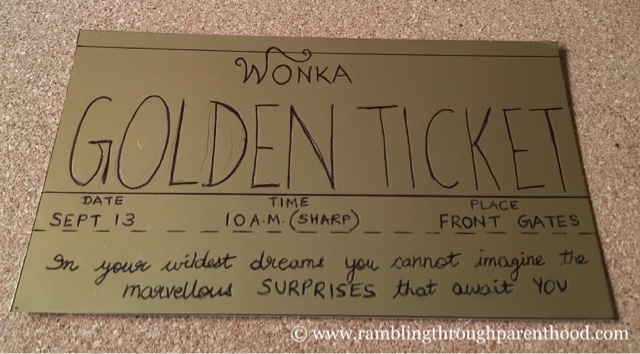 So I spent 20 minutes yesterday afternoon with my craft supplies and ended up creating this rather marvellous Golden Ticket. It didn't take much - a sheet of shiny golden card paper, a black biro pen and a ruler. It’s not just me saying it. J did, the minute he clasped eyes on it. He was thrilled at how wonderful it looked. Then he tried reading it and wanted to know why I had written Sept. instead of September. Then he couldn’t read my fancy joint-up writing, so I read it out to him. Now, J has heard about Charlie and the Chocolate Factory, but he has not seen the film nor read the book. I have been on the look-out for a junior easy reader, similar to The Minpins and Enormous Crocodile, but have not found one. So I did the next best thing. I went over to The Book People and ordered the entire collection! 15 books by Roald Dahl at a bargain price of £21.99. In the meantime, I narrated Charlie’s adventure in the chocolate factory to J at bedtime with a little help from Wikipedia and memories. That's such a shame! I think it was the perfect opportunity to get them interested in books. Thanks, Claire :-) It was super easy to make as well. So we got the effect without the effort! I agree. A bit of fun goes a long way to create and retain interest. Will check these books out for the kids. They sound fab. Check out The Book People too. Can't recommend them enough, after only recently discovering them via a recommendation myself. We really love Roald Dahl. We saw Charlie and the Chocolate factory at the theatre recently. That must have been amazing, I can imagine. Will have to check if they are performing near here. Oh, that is such a shame! Perhaps they can get on board next year? I use the book people all of the time, for both general reading and for the boys home schooling. We bought the Roald Dahl set for my 6 year old little boy. He loves them! Charlie and the Chocolate Factory is his favourite. They really are fab, aren't they? Can't wait for the delivery, so we can get started on the set. I loved Roald Dahl as a child and definitely hope my son will be interested in some of the books when he is older. I hope he enjoys them too, they really are such great fun.